This is a list of the books I have written. They are all available on Amazon.com, and most of them are exclusively on Kindle. I occasionally run promotions on the books ($.99 or free), so be sure to subscribe to my newsletter to stay current on all my sales! Are you old enough to need money, but too young to get a “real” job this summer? Do you need money for a particular goal, like a trip, school clothes, or a new bike? Do you need money in general, just to have enough to go to the mall and a movie with friends occasionally? 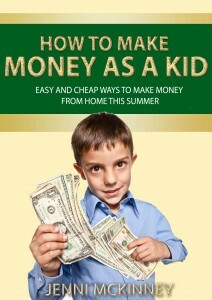 If you answered yes to any of these questions, then “How to Make Money as a Kid: Easy and Cheap Ways to Make Money from Home this Summer” is the book for you! 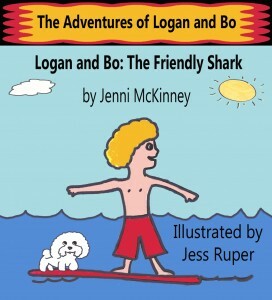 Logan and his little dog Bo encounter a stranded baby shark at the beach. Saving the shark has some unexpected consequences on Logan’s relationship with the school bullies. This is a short, positive bedtime story for boys under the age of 10 who love sharks. I liked “how to money as a kid”. Is Your Hobby a Potential Revenue Stream? I sometimes use affiliate links on JenniMcKinney.com. This means if you decide to make a purchase, I will get a sales commission. But that doesn't mean my opinion is for sale. EVERY affiliate link on this site is to a product or service I have used before or have found useful. Please do your own research before making any purchase online. Thanks!